Removing Mac applications should be easy. In theory, you just drag the application to the Trash. But more often than not that leaves behind residue: not just the occasional preference or cache file, but sometimes gigabytes of stuff scattered all over your disk. There are several uninstaller utilities out there that claim they can remove every last vestige of an app from your drive. But can they really? That’s the question I set out to answer with a bit of testing. After many long hours of installing and uninstalling apps with one utility after another, the answer is anything but clear. When applications are installed and as they run, they may store additional components and support files all over your hard drive. The most common repositories for such files are subfolders within the main /Library folder and your username/Library folder, including /Application Support, /Caches, /Fonts, /Internet Plug-Ins, /LaunchAgents, /PreferencePanes, /Preferences, /Scripts, and /Widgets, to name more than a few. But those are just the most obvious places. Some applications may also install invisible files or put others in normally inaccessible corners of your disk. Also, applications or installers may modify some of your existing system files. For example, if an installer adds an icon to your Dock, it will modify your username/Library/Preferences/com.apple.Dock.plist file. They don’t remove enough. An uninstaller might miss something. In most cases, the consequences aren’t dire—there’s just a bit of disk space that you can’t use for something else. However, problems could arise if residual components conflict with other software or are really large. They remove too much. The opposite—and more serious—problem is when an uninstaller removes something it shouldn’t. For example, you may have two applications from the same developer, and they may share components. If you use an uninstaller to remove just one of those programs, it may remove some of those shared components, and so disable the app you want to keep. Or an uninstaller might incorrectly guess that a given file belongs to an application you’re trying to delete, when in fact it belongs to another and/or contains essential, system-level data or preferences. Uninstallers use several techniques to decide which files to remove. If an application was installed using Apple’s Installer, the uninstaller might check for a receipt file (which lists all the files installed when the installer ran). It might also check an application’s bundle identifier—a string like com.company.product—which often appears in the names of preferences and other support fies. It could also simply look for files with names containing the name of the application. The problem is, none of these methods are fool-proof. Even uninstallers that rely on lists of files provided by the developer. And the fact that an application created or modified a file doesn’t necessarily mean it owns that file, or that it’s safe to delete. I chose four of uninstaller utilities to test: Koingo’s $20 Amnesia, Reggie Ashworth’s $8 AppDelete, Austin Sarner and Brian Ball’s $13 AppZapper, and Synium’s $15 CleanApp. To test them, I installed and uninstalled a variety of software packages, including: Adobe Creative Suite 4 (Design Premium Edition), Bare Bones Software’s BBEdit 9.3.1, DEVONtechnologies’ DEVONthink Pro Office 2.0.2, a bundle of Google Earth and Chrome bundle, Intego’s Internet Security Barrier X6, Microsoft Office 2008, and Telestream’s Flip4Mac WMV Player (also known as Windows Media Components for QuickTime). In each case, I installed the software, applied available updates, and ran it once to give it the opportunity to install additional files. Next, I ran an uninstaller (accepting its default choices), restarted, emptied the Trash (if necessary), and used Baseline ( ) to compare the disk’s before and after states. I then repeated this process for each permutation of application and uninstaller. The dismaying result: No uninstaller removed all the pieces of the software packages I tested. The good news: Almost without exception, uninstallers failed by leaving, not deleting, too much. For example, take my experience with Adobe CS4. The full install added 8.4GB of data to my disk, storing thousands of files in more than a dozen different locations. Adobe’s own uninstaller, which comes with CS4, removed far more of the files than any of the third-party tools did. Yet it still left behind 501MB of data, including Adobe Media Player, portions of Acrobat Pro and InDesign, a few empty folders inside /Applications, and most of the newly added contents of ~/Library/Preferences. . Adobe’s support site offers another tool, CS4 Clean Script, which is designed to remove this additional residue. But it didn’t work on my system. Results with the other installers varied significantly. Amnesia left behind 1.19GB of installed files on my disk; in terms of disk space recovered, that placed it second only to Adobe’s own uninstaller. CleanApp left 2.37GB behind, and AppDelete and AppZapper left 2.48GB each. 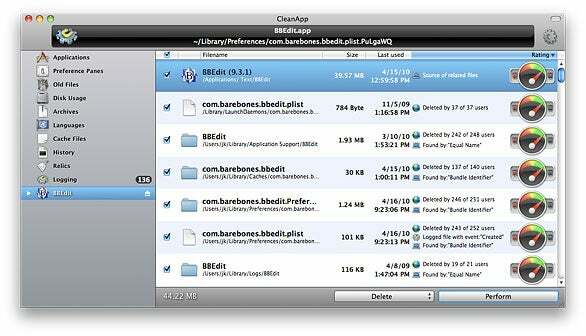 CleanApp did a better job on most apps (except for Adobe CS4) than other uninstallers we tested. Results were similar for other programs I tried to uninstall. In general, the uninstallers provided by the developer—Adobe CS4, Internet Security Barrier X6, and Flip4Mac WMV Player—did the best job. Microsoft’s uninstaller for Office 2008 failed to remove anything in my testing, though it has worked correctly for me before. The uninstallers disagreed on what should go. When uninstalling the Google Earth/Chrome bundle, all except CleanApp left behind components of Google Software Update. I might want to keep those components if I had other Google software installed. But the intention here was to delete everything that came with those programs, so in this respect the utilities failed. Amnesia tended to miss more components than the others did; its superior performance with CS4 was anomalous. AppDelete and AppZapper were consistently similar in accuracy; they typically found more components than Amnesia but fewer than CleanApp. Before you uninstall any software, make sure you have good backups. That way, if you accidentally delete something you need, you can retrieve it easily. If an app has its own uninstaller, try it first. It’s most likely to remove what you want to get rid of without endangering files you want to keep. When using an uninstaller, carefully review the files it proposes to delete. Err on the side of leaving files in place. Consider using a utility that monitors software as you install it or lets you compare your disk before and after an installation, facilitating uninstalling later. Examples include Baseline, CleanApp, Yank ($20), and MacMagna’s Uninstaller ($29). Although these utilities can still make mistakes, at least they give you real-world data about your specific software. Don’t worry about getting rid of every last crumb—because you won’t be able to and it probably won’t make any real difference. If you find some support files that you aren’t sure you can safely delete, chances are they’ll do no harm if you leave them where they are.